Bring on spring by planting hyacinths. If there was a group for hyacinth addiction, I’d be a lifetime member. I can’t resist the pots of forced hyacinths that appear at the grocery store in the midst of winter. When I detect a whiff of that intense fragrance, I literally stop and smell the hyacinths. It’s the perfect remedy for spring fever. 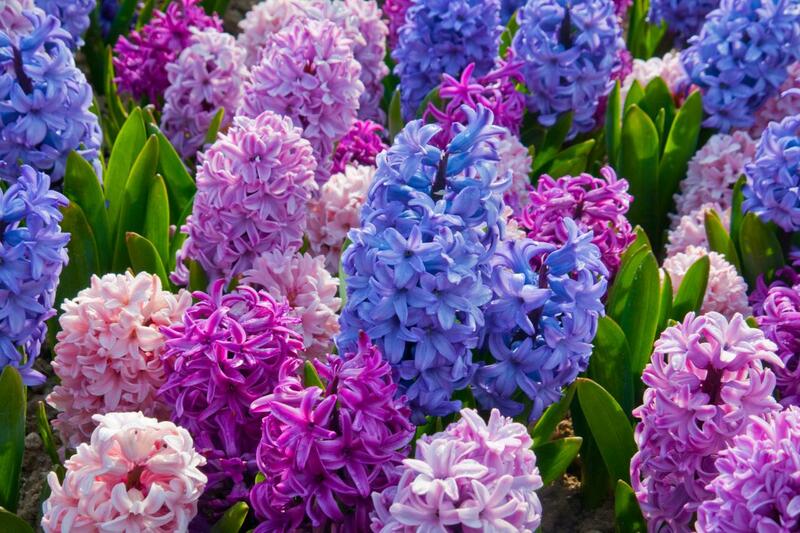 Dutch hyacinths fill spring scenes with fragrance. A single potted hyacinth can scent a small home, and it only takes two—one on each floor—to perfume a larger home. When you can grab 4-inch pots of these bulb bloomers for $2.99, that’s a flower bargain worth snapping up. Learn a few tips to make the most of these spring harbingers. 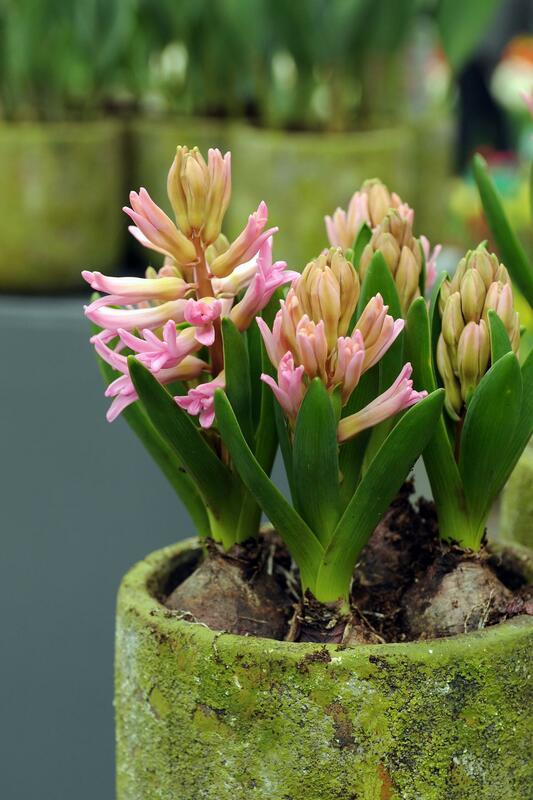 Forced pink Dutch hyacinth bulbs burst into flower and make a perfect pre-spring planting indoors or out. Hyacinths open flowers from the bottom of the spike to the top. Each of those individual blossoms releases fragrance. 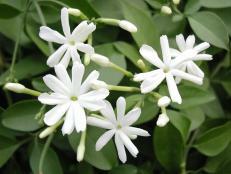 To get the longest-lasting, sweetest-smelling flower display, select a plant with flower buds that are mostly closed. If you don’t care what color the flowers will be, grab the plant with the tightest flower buds. 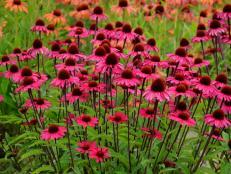 If you want a specific flower color, choose the plant with the tightest buds that show a hint of color. Don’t go by pot labels—they can get mixed up. This pot (above) is at an ideal stage for purchase, providing immediate fragrance from the open blooms and a promise of perfume to come from the budded flowers. 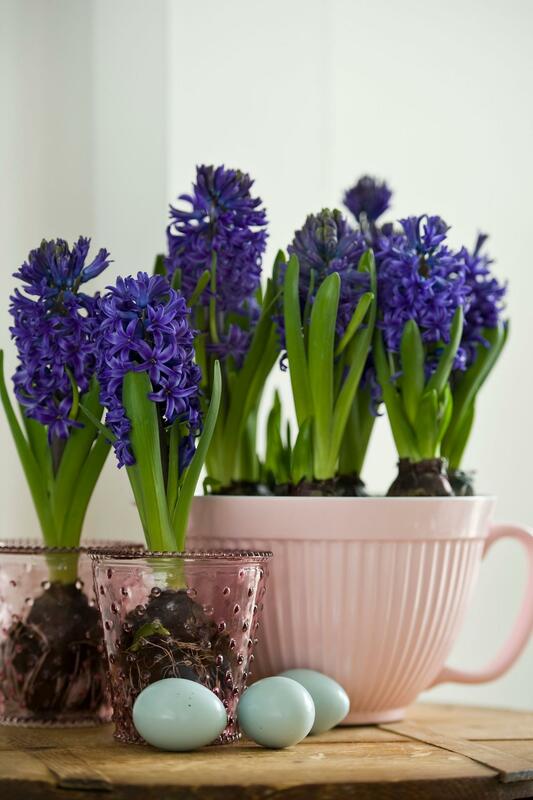 Forced ‘Blue Pearl’ Dutch hyacinth bulbs create a pretty contrast when dropped into pink pots and batter bowl. 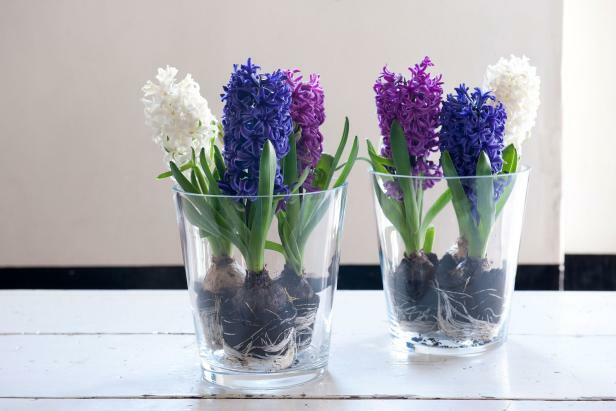 As soon as you get the hyacinths home, slip them out of the plastic sleeve around the pot and into an eye-catching cachepot. Ideally, you should have a saucer beneath your pot or be able to drain the water easily from the cachepot. The best place to display a potted hyacinth is near a bright window in a cooler room (temps in the mid- to upper 60s). If your home’s daytime temps hover higher than that, try to stash the plant in a cooler spot overnight—a non-freezing attached garage, unused bedroom with the heat off or cool basement. Cool air helps the flower show to last longer. For a creative and unusual bouquet, slide hyacinths out of their pots and showcase bulbs and roots. A deep, clear vase supports the top-heavy blooms, which often need a stake and string as flowers open. To water, moisten soil carefully without creating a standing puddle in the vase. Plant forced Dutch hyacinth bulbs into an outdoor container garden for a long flower show. 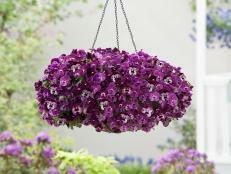 Add pansies in a matching hue. 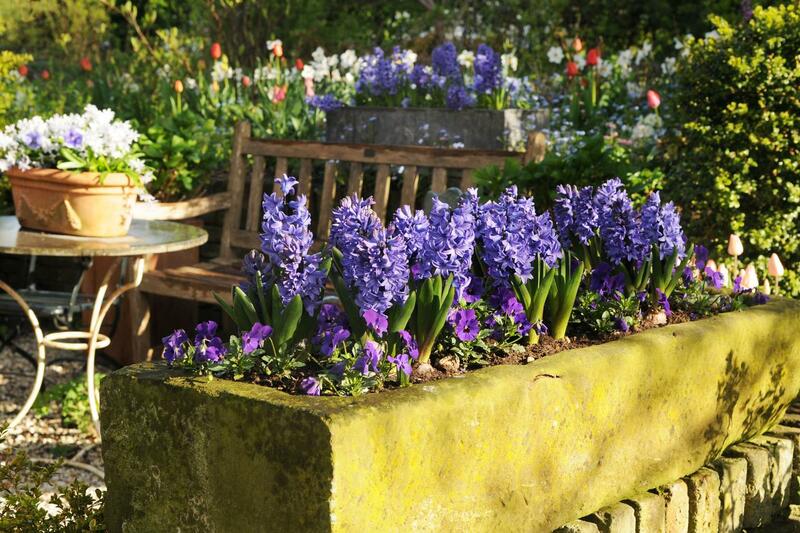 Another option for pre-spring hyacinth bulbs is to shift the plants from their pots into outdoor containers. The plants need to be acclimated to outdoor temperatures and sun, so place them outside for a few hours each day prior to planting, gradually increasing the time each day. Hyacinths tucked into outdoor pots tend to present a longer display than their indoor counterparts. Avoid planting hyacinth plants outside if temperatures are dipping into the 20s at night. They’ll do best if overnight temps hover in the upper 30s or higher. 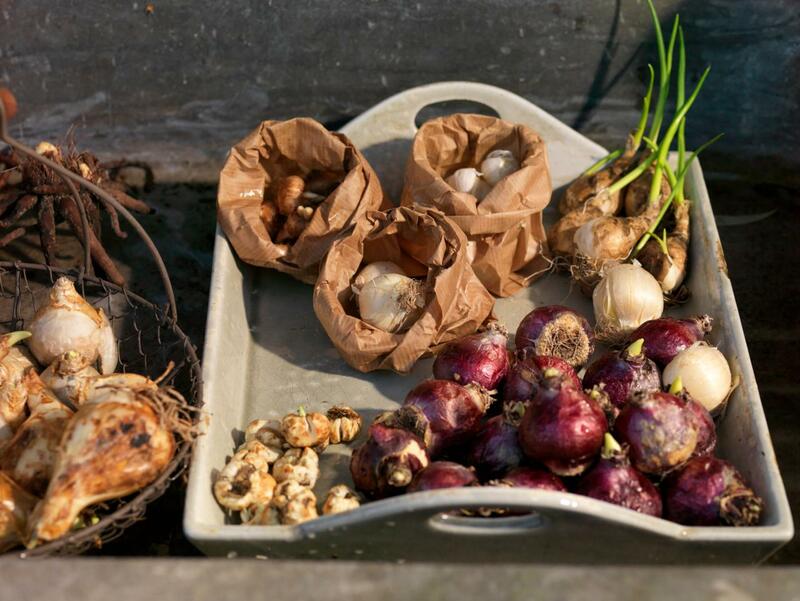 Pre-chilled spring flowering bulbs can come loose and ready for planting. 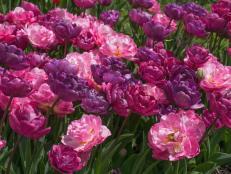 Good bulbs for forcing include tulip, hyacinth, allium and crocus. Another option for planting hyacinths prior to spring’s official debut is to buy pre-chilled bulbs. These hyacinth bulbs have already been chilled by suppliers, receiving the necessary 11 to 14 weeks of chilling to force them to flower. Search for pre-chilled bulbs online to find these ready-to-grow beauties. 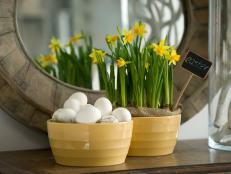 You can also find pre-chilled bulbs of other spring flowers, including tulips, crocus, daffodils and grape hyacinths. Forced Dutch hyacinth bulbs burst into bloom on a windowsill. Forcing jars showcase roots and blooms. When you start with pre-chilled bulbs, explore display options that let the bulbs shine. 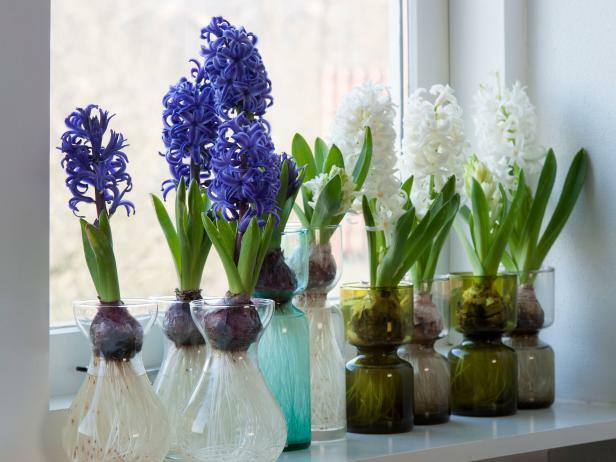 A traditional way to grow pre-chilled bulbs is in forcing jars. These curvy jars support hyacinth bulbs as they sprout roots, leaves and flowers. To find forcing jars, check with florist shops or garden centers, or search online. Keep the jars filled with water to just below the base of the bulb. 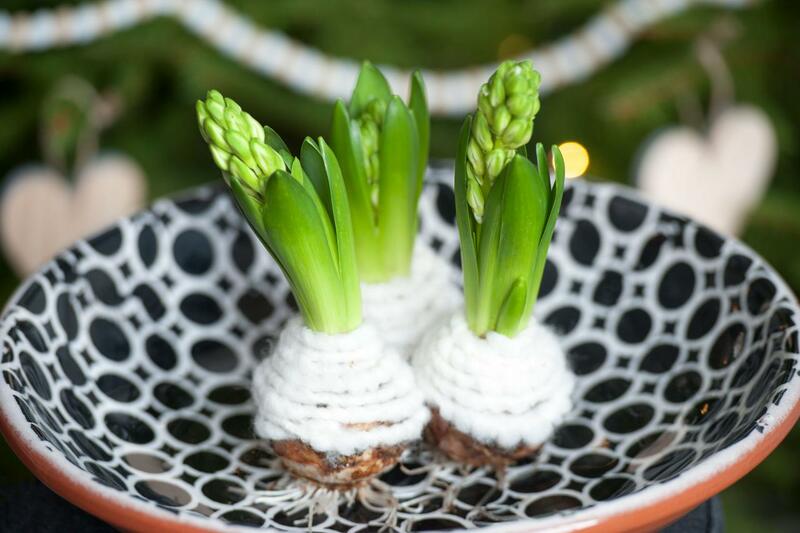 Create a spring centerpiece by wrapping forced Dutch hyacinth bulbs in chunky yarn. Consider other bare-bulb display ideas, like wrapping bulbs in chunky yarn, setting them in a deep glass bowl atop polished stones or perching them in a vase filled with sea glass. Of course, you can always plant bulbs into pots—indoors or out—water, and wait for the show to begin. It takes a pre-chilled hyacinth bulb two to three weeks to grow leaves and bloom—and release that intoxicating scent of spring. Discover the best summer perennial flowers, plants that strut their stuff when temperatures soar. 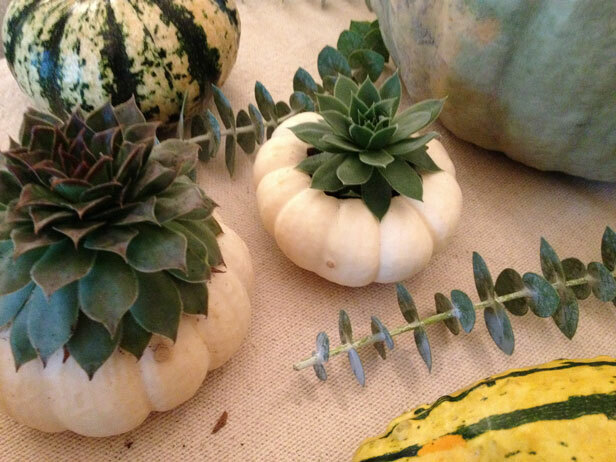 Add fresh color and life to your fall decorations with succulents planted in tiny pumpkins. Plant these hardy, beautiful annuals in your garden for a pretty show all season long. 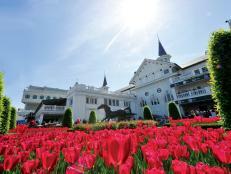 Run for the Roses: Kentucky Derby Blooms! Meet the horticulture team behind one of the most extravagant events around. Does winter weather have you itching to dig in the dirt? 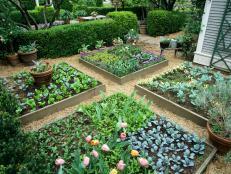 Get tips on when you can safely start planting veggies for spring and summer. 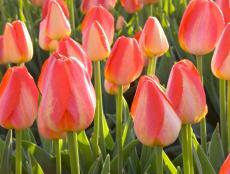 Fall is prime-time for planting hyacinth, daffodils and tulips for beautiful spring color. Plant these bulbs in fall for a glorious show of color in your spring or summer garden. 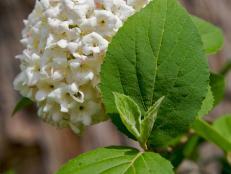 Learn about using viburnum shrubs to bring fragrance to your spring garden.